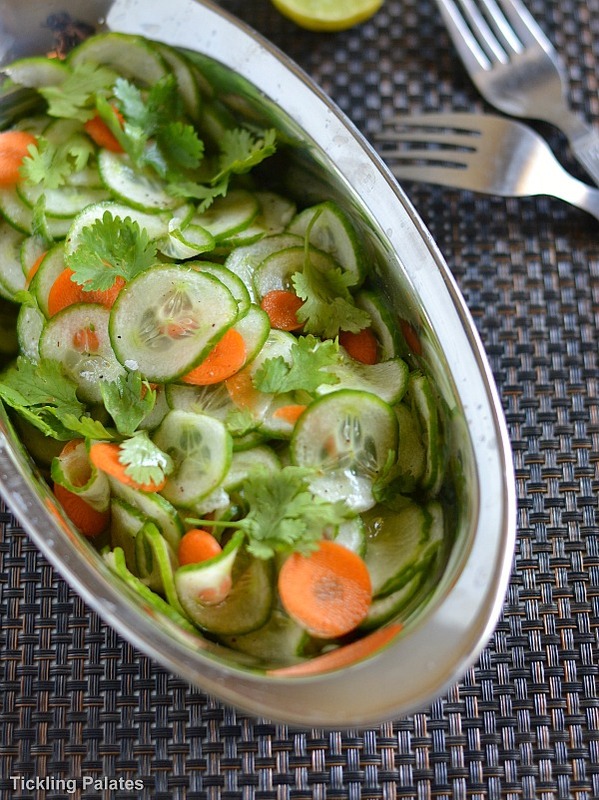 Cucumber Salad recipe with cilantro lime dressing. 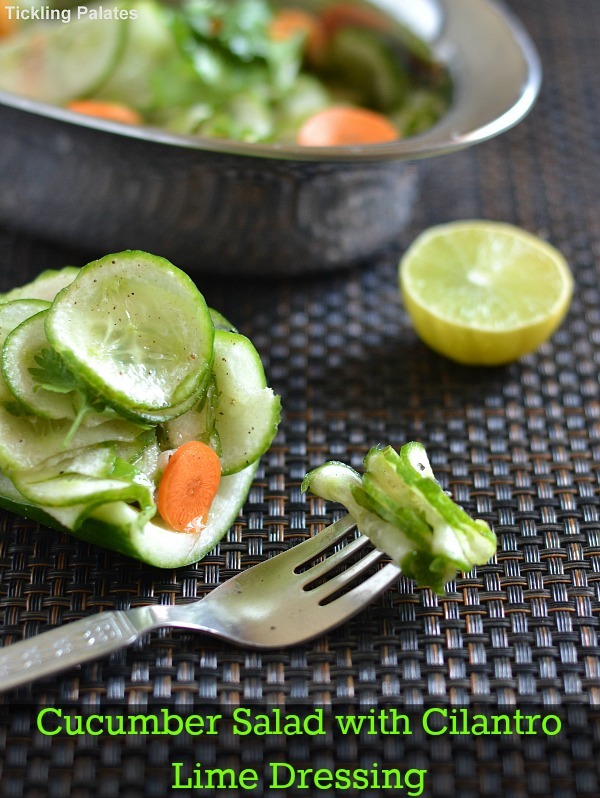 A cooling and refreshing salad that is perfect during the summer season. You can serve it as a side with any of your main meal to keep it light. I’m not sure whether its just me or is it the same with everyone else. Somehow cucumber always reminds me of Summer. And with summer here, its time to keep us well hydrated by eating lots of veggies and fruits that are naturally high in water content. The crunchy, juicy and succulent fresh cucumbers are a delight to munch on during summers when you really do not feel like eating anything at all. Cooking full fledged lunches is bound to make anyone dizzy with the mercury rising like anything outside and who wants to stand near the stove and cook. That’s when breezy, fresh and healthy salads like this one comes in handy. It provides you with all the fibre and nutrients while at the same time making you feel light in the tummy. While eating summer salads like this you do not really have to fear of over eating and if you are doing so, you are only doing yourself a big help as you are hydrating your body. I have avoided using yogurt (Curd) here as I usually combine both of them while making a raitha. But here tried out a simple salad dressing with coriander leaves, lime juice and ginger which makes it very zesty and refreshing during the hot day. I have added carrots to bring in some color to the salad. You can add any other raw vegetable to this salad as this is a very basic one. 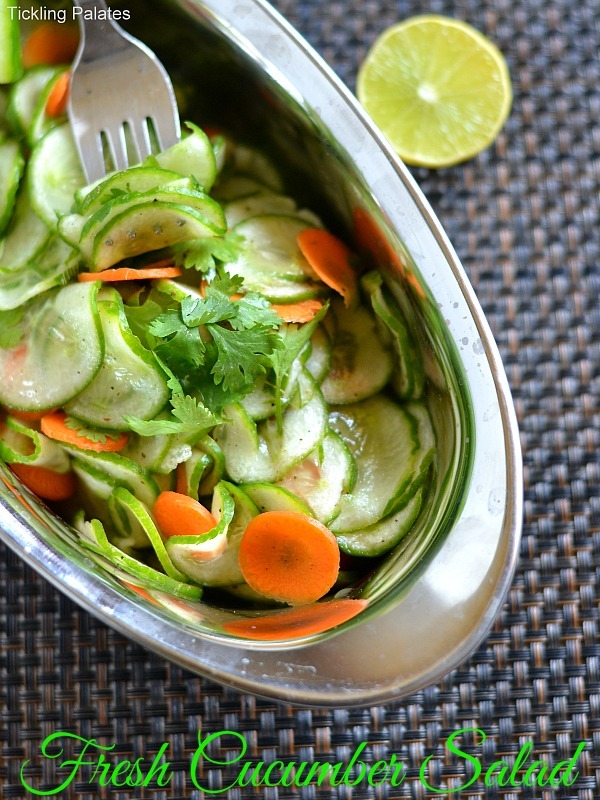 A refreshing and light cucumber salad with cilantro lime dressing. Wash cucumber and carrot and thinly slice them into roundels. I used my mandolin for this. In a wide mixing bowl, whisk together oil, lime juice, grated ginger, black pepper powder, black salt, chaat masala powder, salt till the mixture gets emulsified well. Add the cucumber, carrot, coriander leaves (cilantro) and toss well for the dressing to coat well. healthy and tasty salad.looks delicious.